+1 for orange hood. 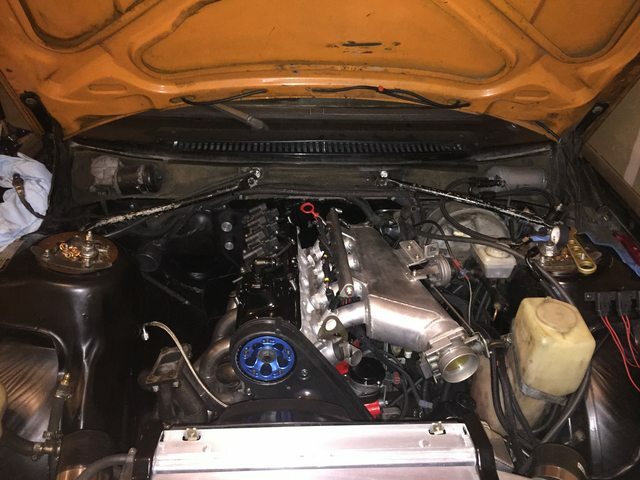 My 242 still has an orange hood. I'll paint the hood when I get around to painting the hood. It's high up on my list of things to do (along with a True Trac), but I have more important things to worry about right now. Like getting the engine installed and running. 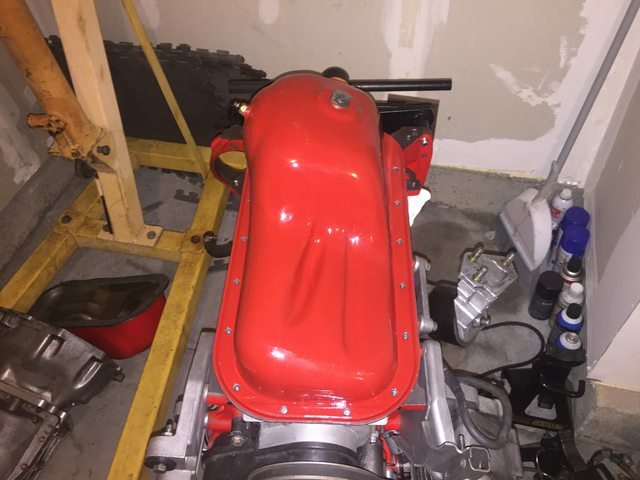 I didn't have much time to work on it this weekend, but the engine is just about ready to go in. I am waiting for a -10 oil return conversion from Yoshifab, and need to put my oil pan on. I also need to finish touching up engine bay paint and then the engine can finally go in. Which brings me to my question. 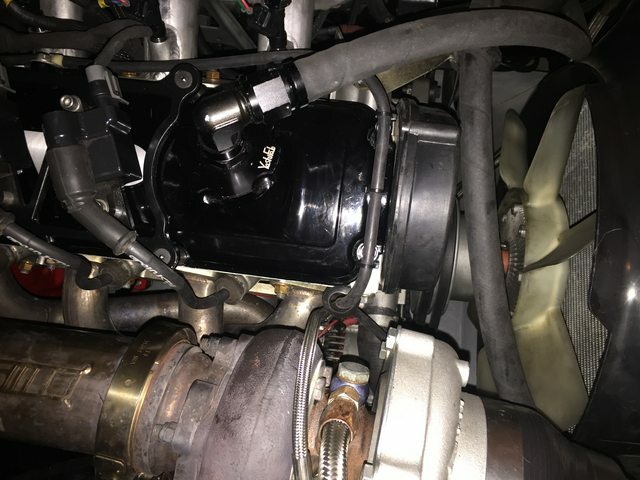 Should I install my oil pan gaskets dry or with some type of sealant? I'm thinking dry and properly torquing, but I'm not sure how that will seal with the crank scraper. They are single piece aftermarket gaskets and the block, scraper, and oil pan surfaces are clean and free of gasket remnants. Oil return... engine is on a stand just tap that bish for 3/4 NPT. I did my oil pan gasket dry, no leaks. Subaru oil pans go on with no gasket, just a solid bead of grey RTV (torque to full amount immediately, no waiting 2 hours nonsense like the black RTV). Doing a few of those and having no leaks has made me a believer. I won't do another oil pan gasket without some grey RTV involved. BUT, I wouldn't use RTV with the gasket. If using a gasket, I like to use that nasty brown aviation gasket glue stuff, applied to both sides of the gasket and the sealing surfaces. I've only tried that on the oil sump gasket on aircooled VW engines, and it didn't work for me. Might have been due to the expansion/contraction of the magnesium vs. steel, I don't know. But the aviation glue always seems to work well. It's incredibly sticky and messy if you're not disciplined with applying it. But it has just enough give to let the parts move a bit, but it is not dissolved or thinned out by the hot oil. Good stuff! 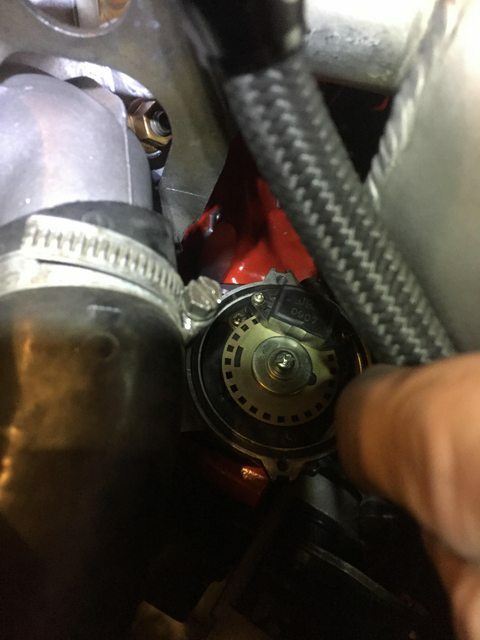 I ended up using an aftermarket one piece gasket between the block and the crank scraper and an OEM 3 piece gasket between the crank scraper and oil pan. Both installed dry. 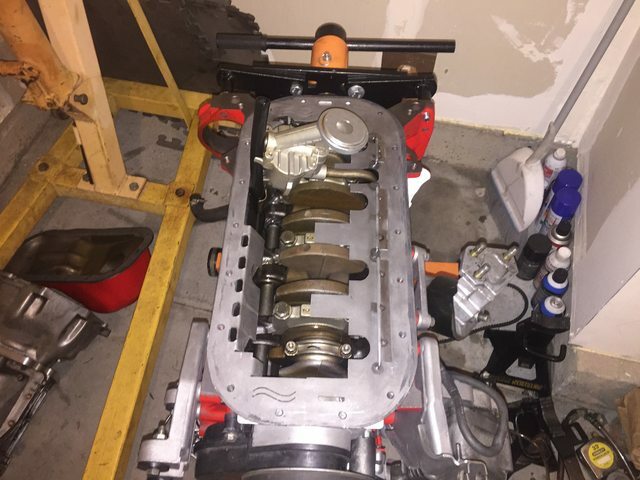 The engine and trans are in. I need to put all the accessories on, make a new alternator power wire and I'm still waiting on my oil return fitting. I also need to get a longer power steering belt. But I'm getting close. Hopefully I can get the majority of it done by the end of the week. Last edited by t8fanning; 10-26-2016 at 12:56 PM..
noiiice. Do you drive the car all year round? I used.. hmm I think it was #4 welding cable for the alternator>starter run. Yep. It's my daily driver. I put my set of studded snow tires to use. I have some 4 AWG wire with some terminals I was planning on using. Progress looks good on this. -Engine block material vs. pan material. Iron block / steel pan CTEs will be much closer than iron block / aluminum pan. I've read theories that too much sealant on the wrong block / pan combination will fail to seal because growth of the pan is enough to break the bond between the sealant and the gasket, letting the gasket slide vs the sealing surface and create leaks. Without the sealant, the gasket deforms enough to maintain sealing. I'm no expert on pan gaskets but have thought about all of the above on myriad different engines I've worked on over the past few years and it's always fun to ponder. That being said I smeared a light coating of Permatex Ultra Gray on both sealing surfaces of my B230FT pan gasket. Hasn't run yet so I'm not sure this was the right move. 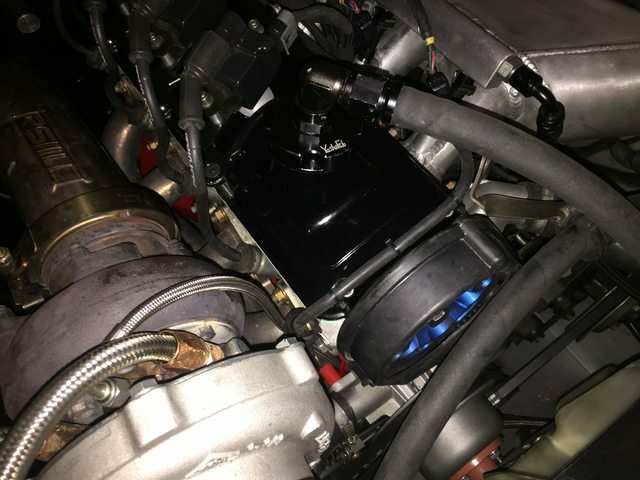 For what it's worth, Jim Grubbs motorsports in Valencia built this engine and they used a thick smear of what looked to be Permatex Ultra Black on and around the seam of both surfaces. It looked like they smoothed a bead with their finger. Based on the amount of time it took to clean off, I'm confident it never would have leaked. I wonder if they did it only because of the scraper, if they do it for all engines, or just iron to steel interfaces. 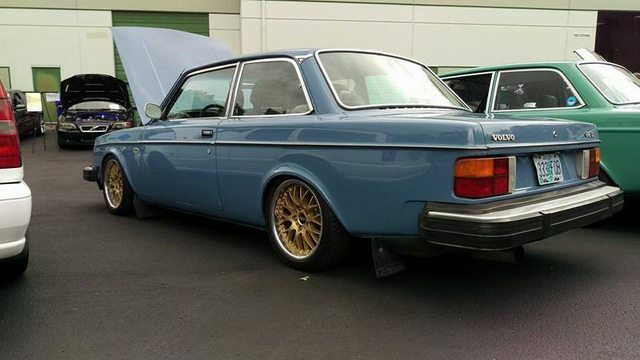 When you run your B230FT, I'd be interested to hear how the gasket holds up. I've thought about it, but I like the simplicity an reliability of a clutch fan. For those reasons, and because I'm out of outputs on my microsquirt, I haven't worried about an e-fan yet. However, that might change after I break in this engine. I made a little bit of progress tonight. 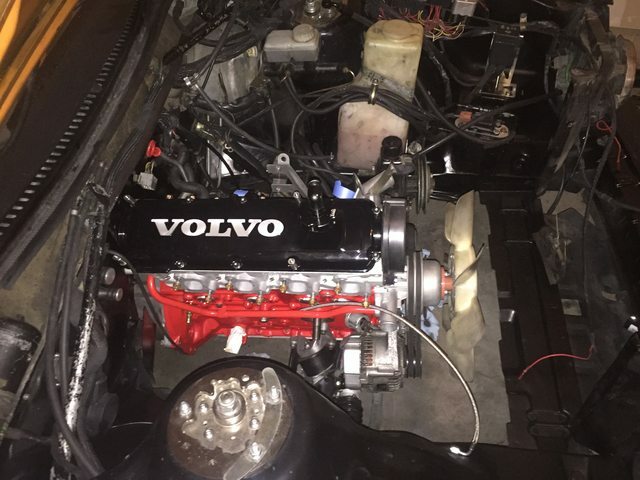 I put the driveshaft in, bolted the motor and transmission in, put the front end back together, plumbed a few coolant lines and modified some wiring to work with the new Volvo coolant temperature sensor and new ID1000s. The intake and exhaust manifolds aren't on yet, just test fit. 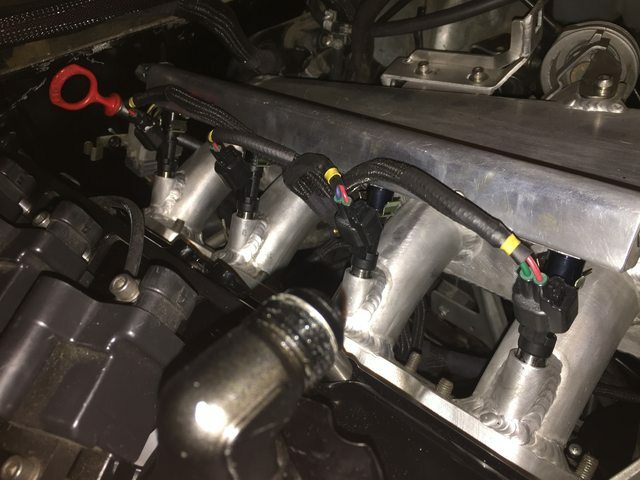 I like USCAR connectors much more than EV1 connectors. 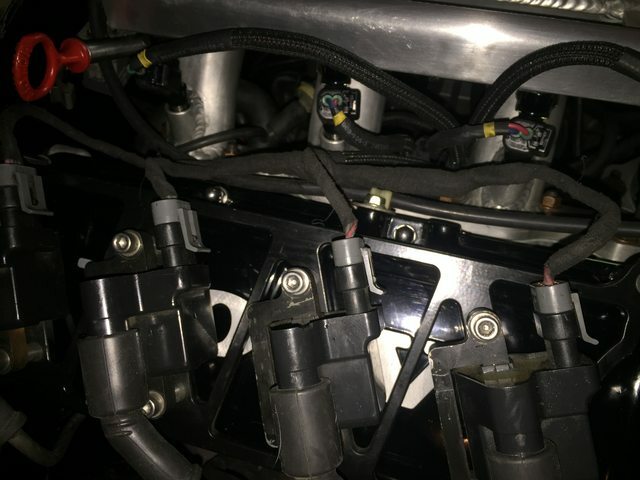 However, when I was cutting off the old EV1 connectors, I forgot I had just removed the tape covering the intake ports. I clipped the old connector and heard a tinkle as the two connectors fell. I didn't see where they both fell, but it sounded like one fell into an intake port. 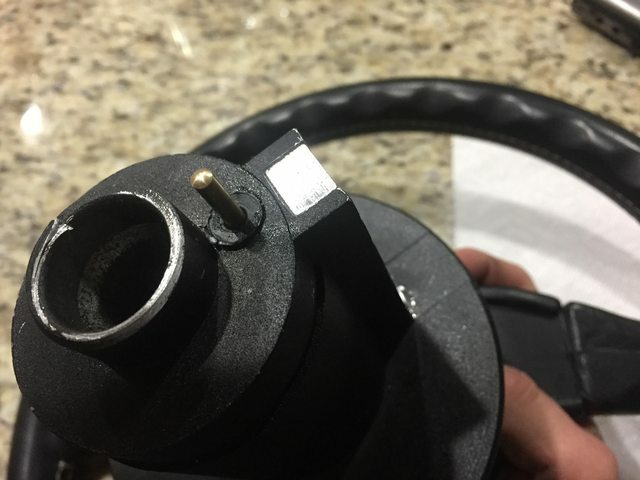 Of course the valve was open, so I think I have a crimped connector sitting on a piston. Looks like I'm stopping by Harbor Freight tomorrow and picking up the cheapest borescope I can find. If it is indeed in the cylinder, I'll probably try to vacuum it out. Any other ideas how to get it out without taking the head off? I'd really like to not waste a cometic gasket and keep the head on. 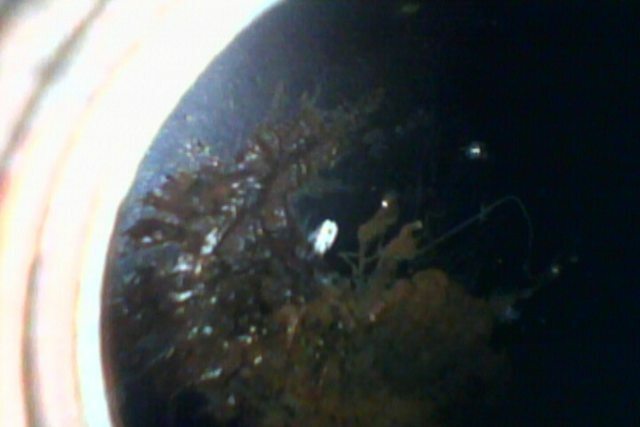 I picked up a borescope from Harbor Freight and checked out my cylinders. Good news! I am reasonably confident nothing fell into any of the intake ports. I can't be 100% sure because my scope doesn't allow for a full view of the top of the pistons. I did move the camera around as much as I could to try and get a full view. I think I got it all, but there is a slim chance I missed a section. In any case, I feel good enough to not pull the head and run the engine as is. Cylinders 1-3 seem great, nothing noteworthy. However, I saw some stuff on the top of cylinder 4. I think it is assembly lube, but I'm not quite sure. Any guesses as to what it is? Maybe it's the black paint that's supposed to be on your hood? 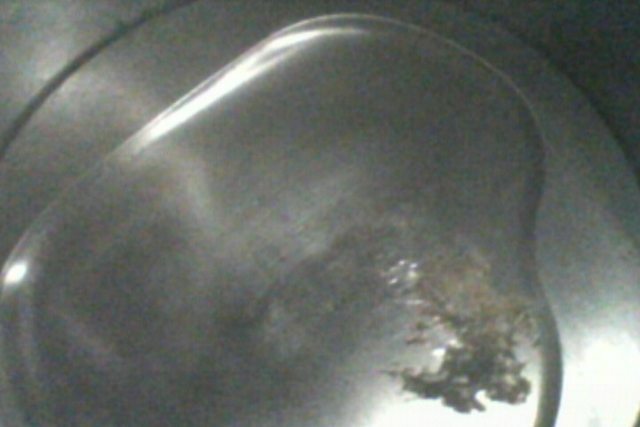 LOL, looks more gooey than pitted or dented to me. I'd guess assembly lube too. Maybe it's the black paint that's supposed to be on your hood. Ha. I'll paint it soon. Definitely before Davis or IPD. Yeah it's definitely gooey. I saw some of the same stuff on the cam. I'm hoping to get it started this week. Finally made some progress, and got it to start. It took forever for me to get the CAS setting right. 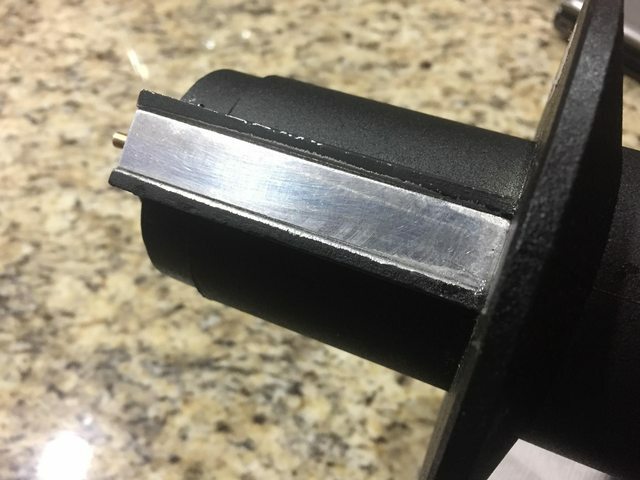 I cut off the outer mounting surface that fouled on the rear timing cover so I could have some adjustment, and set my trigger angle to 60°, but could not for the life of me figure out why the timing was so wrong. Eventually, I put the large slot on the other side of the CAS and set my trigger angle to 70 degrees. This finally hit my fixed 10° BTDC. The aux gear also still lines up with its timing mark, which is nice. This is what my CAS looks like with cylinder 1 at TDC. I am using the CAS with the connector on the body, which puts the sensor in a different position than those with wires on the body. Once I get it idling a bit better, it's time to break the engine in. Last edited by t8fanning; 11-08-2016 at 02:51 AM..
you have no idea how happy it makes me to hear it running and see it being put to use! Just wait until you get some video of an actual pull once it's broken in. Then you can really be happy. I've been busy breaking in the engine lately. I had to add a ton of fuel over the whole map to deal with the bigger valves. I also decided on the motoman hard break in method. After I got the engine running decent, I drove around for about 15 miles doing some hard accelerations/decelerations with no boost. 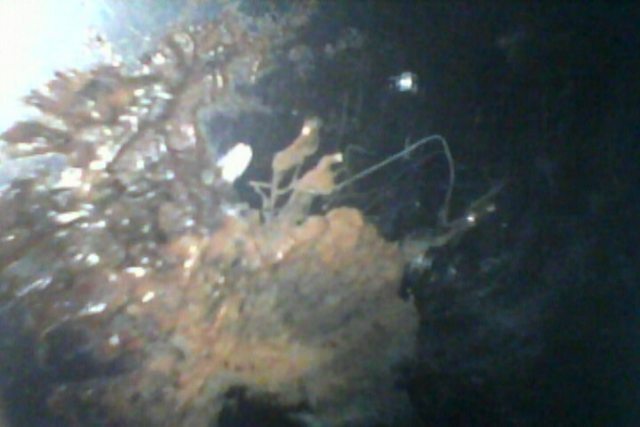 I then realized I was spewing oil all over the place, so I limped it home. When I got home I still had decent oil pressure, so I think nothing got hurt. Turns out I botched the oil cooler sandwich o ring. After I replaced that and resealed the oil pressure sender threads, no more oil leaks. I changed the oil with some dino 10w-30 and drove it to and from work for about a hundred miles. Oil pressure was a little lower than I wanted despite the high pressure oil pump spring. So I changed the oil again but used 10w-40. That bumped up pressure a little bit and made me feel a little better. I've been driving it around trying to get some miles on. Things are feeling pretty good at 5 psi, so much more torque than my old B21ft. I want to put some more miles on before upping the boost. What was the lowish pressure you were getting before the oil switch? I get good pressure driving but I'd like to bump the idle pressure up a bit. I have Joe Gibbs 5w 30 in it, was thinking I'd go to 10w 40 as well. Not surprising considering squirters, big oil cooler lines, and -6 feeding the turbo. It was a little less than 1 bar to 1 bar at hot idle and full throttle was right around 3 bar with 10w-30. It is now 1 bar to ~1.5 bar at hot idle and 3-4 bar at full throttle with 10w-40. Not surprising considering squirters, big oil cooler lines, and -6 feeding the turbo. Exactly. I think the squirters reduce pressure pretty significantly. The B230 also required a bit longer feed line for me, which might have a slight effect although I am using -4 instead of your -6. But all the additional volume for oil to go probably caused the reduced pressure from my B21. I will probably switch to 5w-40 in the future just to have a little extra cold temperature range, although this car will be a death trap in the snow.